Roots, critical points and intersections of simultaneous graphs (graphs of two or more functions on the same coordinate plane), can be shown all at once on the display screen. 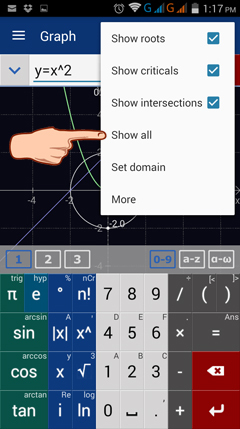 Tap the special points function key in the top right corner and check each option. Then tap Show all. Oscilloscope Calibration Solutions by Fluke®. Get a Free Quote Now!